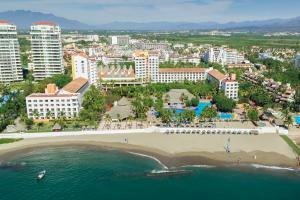 Relax on the beach or at the pool in Vallarta at this all-inclusive, oceanfront paradise.Children will enjoy the latest family program concept, Kids & Co by Melia: Mini Kids & Co (ages four months to four years); Kids & Co Club (ages five to 11 years old); Teens’ Leader (youth between 12 to 15 years of age); and Kids & Co Spa services too. Experience superb dining in any of four restaurants with unlimited drinks. M-Floor: Concierge offers vacation assistance, twice-daily maid service, nightly turndown service and upgraded room amenities. Discover our new family concept Kids&Co. On the beach, 15 minutes from downtown, 5 minutes from the airport. Hot Air Balloon Tours, Horseback Riding, Adventure Tours, Whale Watching, Deep Sea Fishing, Golf (Additional Charges Apply), Shopping, Cultural Activities, Snorkeling, Church, Monument, Museum and Night Club, Sailing and Windsurfing.